There are no shortage of iconic skits on Saturday Night Live…from the early days four decades ago to present-day, we’re gifted with hilarious original characters and unforgettable one-liners nearly every single week. So we’re shocked to learn that one of the most recent fan favorites, David S. Pumpkins, almost didn’t feature David S. Pumpkins at all. Allow us to explain. The Halloween-themed skit featured Tom Hanks as David S. Pumpkins, a decidedly not-scary part of a theme park ride that blends Haunted Mansion and Tower of Terror, with plenty of scares but no free-falling drops. What the world unknowingly needed was Tom Hanks dancing in a head-to-toe pumpkin suit, providing us with an instant Halloween classic. But one SNL writer reveals how different the sketch originally was, and we’re listening. SNL star and co-writer Mikey Day just spoke for the first time about the origins of Mr. Pumpkins, and he’s blowing our minds. In an interview with Uproxx, Day explained his thought process behind the skit. “It was just going to be a dance – it started with a couple who were staying in a creepy hotel and it’s sort of Haunted Mansion style. Like ghouls started coming out, ‘Ayyy!’ Everyone came out and sang a verse and then we would come out of coffins and just dance and go back in. It wasn’t really working and then I remember Tower of Terror at Disneyland, that ride, thinking it’s a great setup because it’s just doors opening. It’s just such a great device for doors open, something dumb. 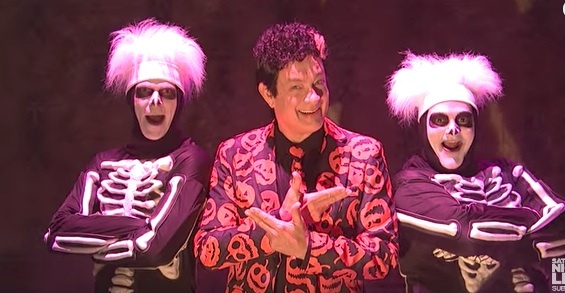 We’re kinda thrilled that David S. Pumpkins ended up being delightfully weird and totally un-sassy at all. So there you have it. Any questions?